Built in the 50's for ATSF, the cars served under Amtrak, then were "retired" to Beech Grove. 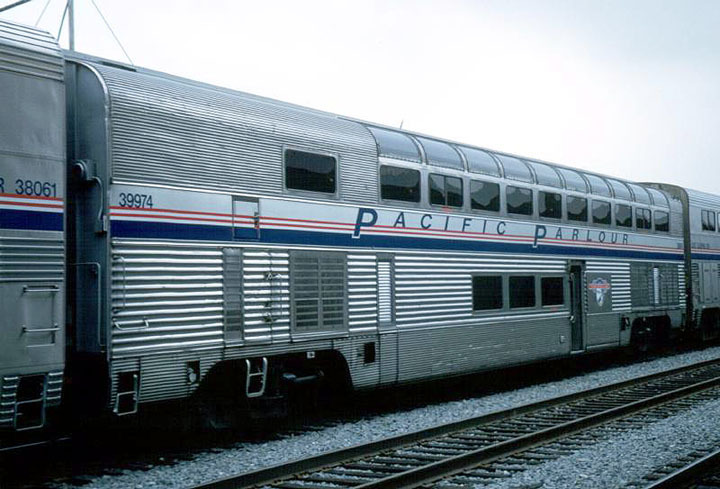 In an attempt to upgrade the Coast Starlight, 5 of the six lounges were rebuilt and serve as the "Pacific Parlor" lounge car for first class passengers. Four of the cars operate in the regular consists, and the 5th is rotated into the consists as needed for servicing. Amtrak car numbers are 39970 and 39972-39975. 39971 was an un-upgraded car, but also bears the "parlor" decal. It had been used occasionally on other trains as a backup lounge but was later sold. Virtualy all of the HEP rebuilds�took place at the ATSF Topeka�shops under contract, with the exception of 39900 and 39901 which were stored at Beech Grove and HEP rebuilt there. 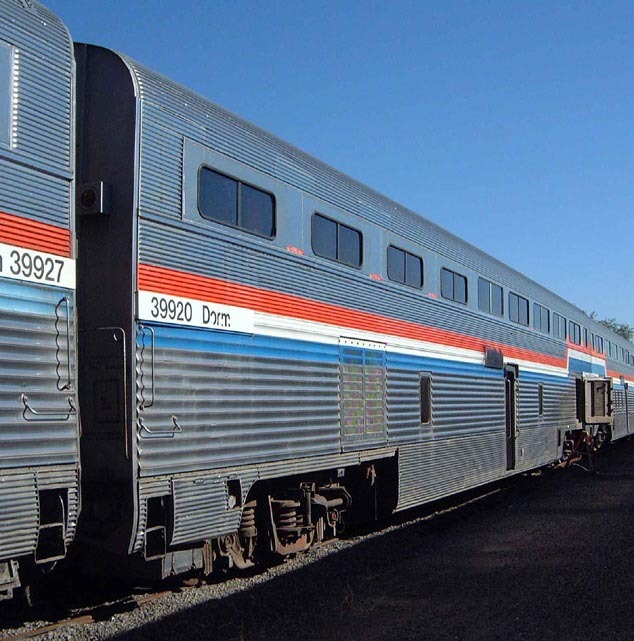 All of the cars�initially released from Topeka during the 1980-81 HEP program retained their�Santa Fe seats; however as time went by a number of the cars received newer "Superliner" type seats, usually following some form of wreck repair work. 39931/9931/731 - (z) Philip Sheridan to King Publishing/Chuck Crisler - sold to Jim Stephenson Houston TX. Listed for sale 2008. 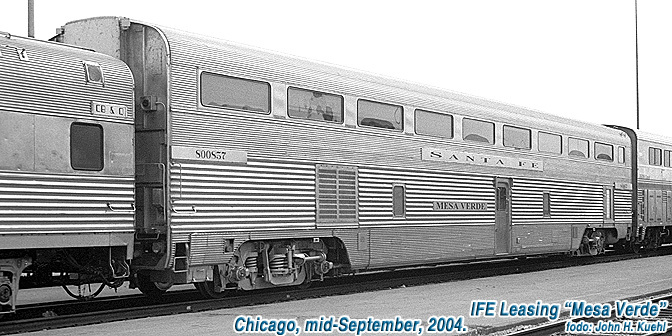 39935/9935/735 - Philip Sheridan/IFE Leasing - restored to ATSF configuration as "Mesa Verde" (800857). 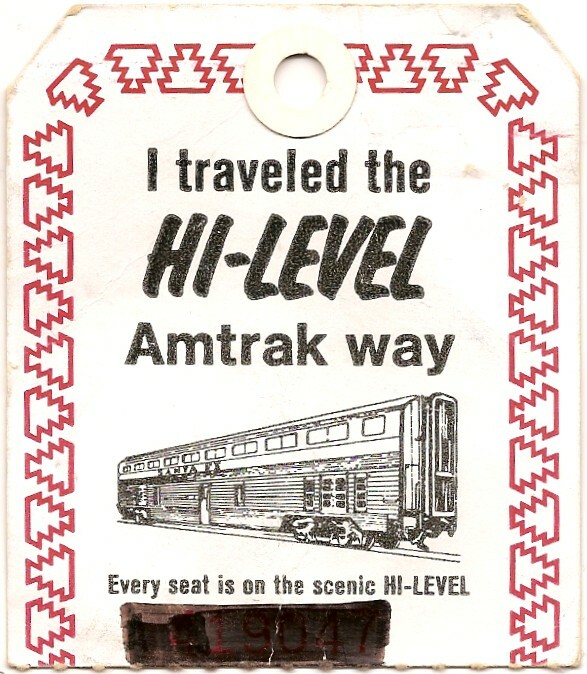 First hi-level with an Amtrak 40 year overhaul - retention toilets - sill work - trucks rebuilt - removing 'Amstuff' inside revealed original Santa Fe artwork. 39970/9970/575 - Amtrak "Columbia Valley"
39972/9972/577 - Amtrak "Napa Valley"
39973/9973/578 - Amtrak "Santa Lucia Highlands"
39974/9974/579 - Amtrak "Sonoma Valley"
39975/9975/580 - Amtrak "Willamette Valley"
(a)9922 wrecked 10/02/79 Train#4 Lawrence KS. Train entered 35 mph curve at 80mph - car shot over a waist high retaining wall shearing off virtually everything below the floor line. (c)39910 wrecked 7/07/85 Train#8 Elmira ID. Sent to Texas A&M 1995 for fire training use. 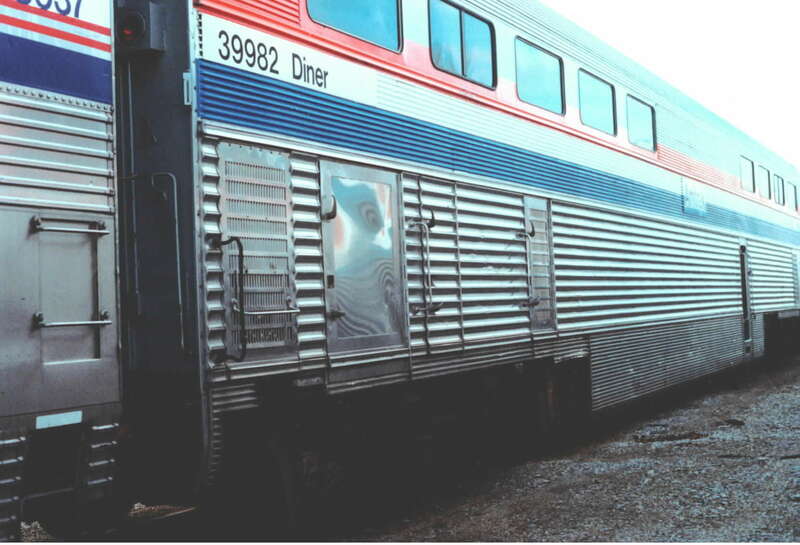 (g)39944 burned 3/1/03 in New Orleans as train 59 was being serviced - probable cigarette in trash in lower restroom. Trucks to UP 7007 "Southern Hospitality"
(h) Amtrak pulled all coaches from service in 2007 and put them in storage. (x)There were only 4 "straight" (72 seat) coaches rebuilt into "step down" transition dorm cars. These were 39900, 39901, 39937, and 39938. These four cars had a different floor plan, with 37 coach seats and 16 dorm rooms upstairs and downstairs. 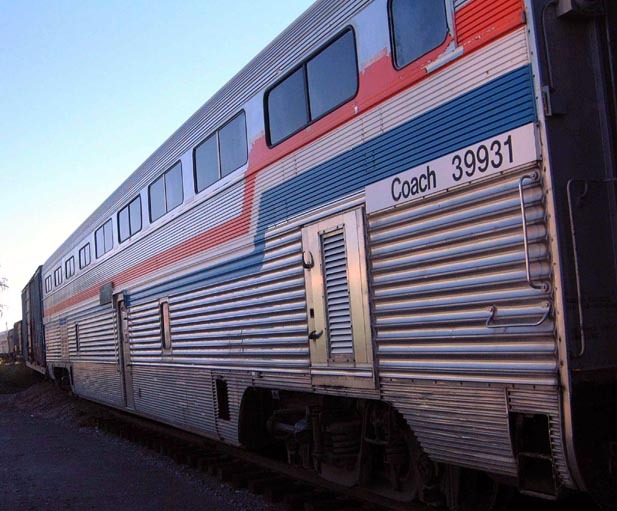 After rebuilding, the excess ATSF coach seats were installed in Amtrak coaches 4740-4742. All other rebuilds for "Trans-Dorms" were from the original "step down" cars built for the AT&SF. These cars had floor plans that varied slightly from one to another, with 34 to 40 coach seats and 16 to 18 crew rooms. (z)Four 68 seat transition cars were rebuilt with 72 seats and hi-level pass-thrus at each end - 39925, 39931, 39932, 39934. (jhd) "Possibly"? this was done to replace the 4 coaches converted the other way?